Archdragon Peak is a Location in Dark Souls 3. The Unkindled is transported to this location when the "Path of the Dragon" Gesture is used adjacent to the Dragonkin statue/corpse found in Irithyll Dungeon. Click here to go to the speedrun section. 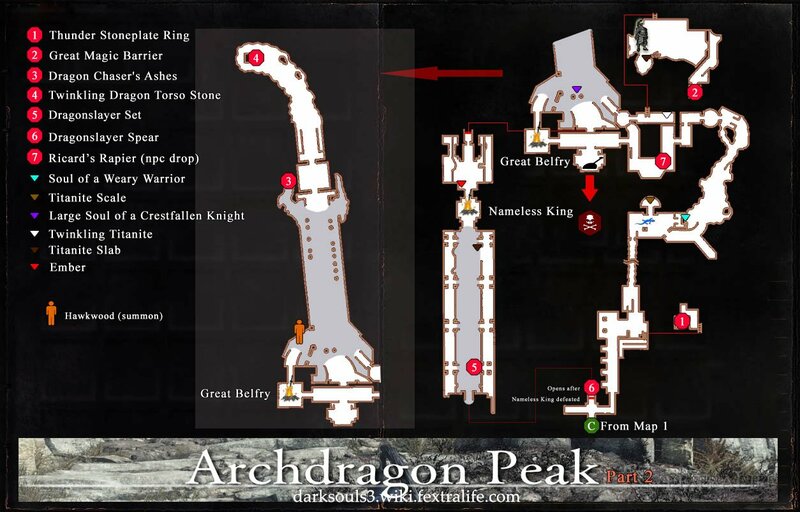 To reach Archdragon Peak, you must obtain the Path of the Dragon Gesture from Consumed King's Garden, and make your way to Irithyll Dungeon, beside the location of the Dragon Stone Torso, where the petrified dragon acolyte is seated in a meditation like position. Stand on the rug to the left of the acolyte and perform the Path of the Dragon gesture. A cutscene will play and you will be transported to the cliffside. Proceed forward. To your left by a tree will be a corpse with Soul of a Weary Warrior 1x. Continue up the path to encounter two Man-Serpents and to his right a Lightning Gem 1x. Continue up the left path to find Homeward Bone 2x. Up ahead will be several fire casting Man-serpents. To their right, by a rock will be a corpse with Titanite Chunk 1x. Beyond them you will find a corpse with an Ember and the Archdragon Peak Bonfire. Take the stairs right of the bonfire to find a corpse with Soul of a Nameless Soldier 1x and Titanite Chunk 1x on the landing here. Up the stairs you will find 2 more Man-serpents on top of an overhang. Near the large one you can find an Ancient Dragon Greatshield. Near the left stairs leading up to this overhang you will find a Titanite Chunk 1x. If you hop down the short stairs here you will find a Large Titanite Shard 1x. To the left of the large building, you can head down a path along the wall until you come to a hallway on the right with a Man-serpent. Behind will be a corpse with Lightning Clutch Ring. Make your way back to the building with the large gate and pull a lever to the left to open the gate and take on the first boss of this area, Ancient Wyvern. In this boss arena you can find an Ember 2x and Stalk Dung Pie 6x, as well as Large Soul of a Weary Warrior 1x. Along the right side of the steps, follow the edge to find a Ring of Steel Protection. Up the stairs and to the left you can find a Lightning Urn. If you head inside the building you will find Man-serpents (if they survived the boss fight) and to the left a bridge. Cross into the next room and make a left to find a Titanite Chunk 1x and a Man-serpent. Take the ladder in the doorway to find a corpse with Twinkling Titanite 2x. Return to the building's main floor and take the staircase up and make a left up the next staircase to encouter 2 Man-serpents. Take a left into the doorway and head left up the stairs. At the top you will find Titanite Chunk 2x and Lightning Bolt 12x. You can drop down from where the bolts are to reach a bridge that you can take to find 2 Man-serpents. Beyond them you can proceed to the building and take the ladder to the left of its doorway. At the top is a plank ledge you can walk along and drop down to another ledge. Take the ladder up to the next ledge and walk to the end to find Twinkling Titanite 2x. Defeat the Wyvern to obtain the Dragon Head Stone. A cutscene will play and you will be transported to the Dragonkin Mausoleum Bonfire. Enter the doorway nearby to face off against a Drakeblood knight, or Havel the Rock, summoned by a Serpent-man Sorcerer. Whichever it is, once defeated will drop the Drakeblood Greatsword. Exit through the central doorway up the stairs and make a right at the top. Head up the stairs ahead to encounter a Rock Lizard. On a corpse hanging over the railing here is a Titanite Scale 1x. Continue up the stairs to find a Titanite Scale 1x on the left. Head right into the building and take the path right, to come to the Serpent-Man Sorcerer responsible for the Drakeblood summons. Continue around the path to the opposite end of the room to find Soul of a Crestfallen Knight 1x on a corpse in the corner. In a room leading out you will find 2 Man-Serpents and a corpse with Titanite Scale 1x. Head back into the building and make a left to find a lift in the corner you can activate to unlock a shortcut to the beginning of the area. Go back up the lift and return down the stairs to come to an altar in front of the dragon statue. Perform the Path of the Dragon Gesture to receive the Calamity Ring. Head up the main staircase here and approach the large gated door. Examine the gate when prompted and you will obtain the Dragonslayer Spear here. Take the stairs to the right of the gate down. Proceed along to find a Man-Serpent waiting in ambush on your left and another 2 with shields ahead. Watch out for the big man-serpent up ahead. There is a 3rd small one on a wooden plank ledge to the right. From this ledge you will find a ladder going up. If you take this to the top you will find the Thunder Stoneplate Ring. Take the ladder back down and proceed along the network of plank ledges into the next building where you will find a Crystal Lizard to the right. Up the stairs you will find a chest with Titanite Scale 3x. Exit the building and head left up the stairs to encounter a Rock Lizard. At the top of the steps a wyvern will swoop in. He will linger in this area to attack you, and will fly to the top of the high tower nearby if you leave the immediate area. It will return once you traverse the ground here again and breathe steady bursts of fire. Ranged attacks are ideal here, where you can shoot from the cover of the near building. Killing it will earn you Titanite Chunk 6x, Titanite Scale 3x, Twinkling Titanite 3x and 50'000 souls. If you head left, a corpse in the doorway will have Soul of a Weary Warrior 1x. To you melee fanatics, stay underits neck, closer to its neck. Bait its fire breath, stay safe near the neck, and wail on it, allowing many free hits. Ultragreatsword works well here. Pestilent Mist is fantastic here too. It may bite, roll as needed, and dash into the window back to cover if you need to heal. Once the wyvern is down, continue up the stairs where you will face 4 Rock Lizards. Enter into the building ahead and head left down the short stairs and right through the doorway to reach the next room. Left will be an area where the summons of the Man-Serpent Summoner will spawn in. You may find yourself facing off against Ricard or Havel the Rock. If you go up the stairs near this spot, you will find the summoner to dispatch, stopping the spawns. Head left to exit this room and on your left you will see a lever with a large bell ahead. Messages on the floor will warn against ringing the bell, causing all to disappear. Ignore the lever for now and continue to take the path into a room where you will find the Great Belfry Bonfire. Take the doorway to the right of the bonfire to come to crumbling ruins. If you head right down the stairs through open gates you will find a corpse at the end with an Ember 1x. Return back to the main area and to the right you will come to a set of stairs with a Rock Lizard and Man-Serpent at the top. A chest here contains Twinkling Titanite 3x. There is a ladder on the balcony here that you can take up to find a Havel NPC standing before a fallen wyvern. He is a tough foe, wielding a greatshield and a Dragon Tooth that packs a punch. He can buff himself with a poise boost as well. Kill him to obtain the Dragon Tooth and Havel's Greatshield. You can go to the left of this arena and drop down off the ledge where you'll find another Rock Lizard and Great Magic Barrier. It is also good to know that once Havel is killed, return to the stray demon area, by traveling to the farron wolf covenant bonfire, to find Havels armor set. Once Havel is dispatched, you may find a Titanite Slab 1x on a corpse next to the wyvern's claw. Return to the central courtyard of the ruins. In a circular spot, flanked by 2 broken pillars you will find Large Soul of a Crestfallen Knight 1x. There will be several Man-Serpents straight ahead, including three big ones. Try and engage them 1 by 1 to make things more manageable. Or summon Hawkwood to help clear this area, he'll leave once you get to the altar anyway. Before entering the archway ahead, head left to find a Rock Lizard. Behind it will be a corpse with the Dragon Chaser's Ashes which will unlock Titanite Chunks, Twinkling Titanite and Titanite Scales at the Shrine Handmaid in Firelink Shrine. Enter the archway and ascend the long stone stairs to come to a stone altar at the very top, overlooking a massive dead dragon. Perform the Path of the Dragon gesture at the altar to receive the Twinkling Dragon Torso Stone. Return back to the location with the lever and large bell. Pull the lever to trigger a cutscene. The landscape and weather will alter dramatically revealing a cloudy path forward. Step onto the storm cloud path and enter the fog to face the powerful boss, Nameless King. Ring of steel protection and the thunder protection ring will help in this fight, and these can be found in the wyvern boss area. Defeat him to obtain Soul of the Nameless King. A cutscene will play and you will be teleported to a Bonfire. Light it and ahead you will find a Titanite Slab 1x. Make your way to the far end where you will find the Dragonslayer Set on the left. Step through the open gate to return to the area where the Man-Serpent summons unkindled. 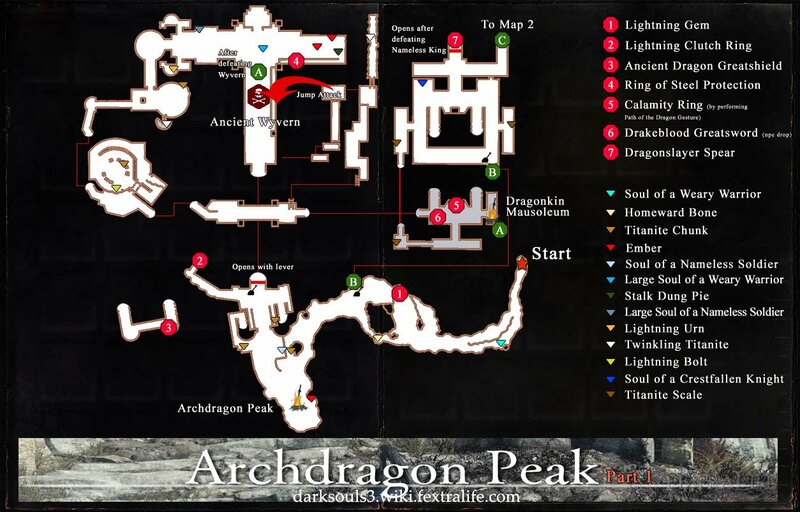 Make your way back to a bonfire and your journey at Archdragon Peak is complete. A fast the end of the level the fastest, picking up only essential end goes here. Anyone else know what happens if you knock Havel of a ladder, kill him, and don&apos;t get his stuff? If I did that, is there any way to get his stuff? so whats the rng for Havel to appear downstairs, if summoned from the Sorcerer? I thought it was a player hack as I always get those knights. Does Havel have to be still alive up top? Don&apos;t let that massive health pool fool you this is the easiest boss to kill in the game because there is an easy way to one shot it. Follow the path at the back of the arena and get above it, afterward you guys should know what to do. This area looks like like a dusty version of the area after the Asylum Demon in Dark Souls 1. Gorgeous mountain view, refreshing bright blue skies to contrast the omnipresent gloom found in the rest of the game, and imposing ruins built in a vaguely Roman-Byzantine architectural style. 10/10, best place in the game. The second wyvern killed itself and gave me the loot. Playing on version 1.0 of the game on PS4. holy cow, i took like 20 tries on phase 1. Just wasn&apos;t able to do damage to the guy. Proud of myself that I only took 2 tries for phase 2. Not sure if it means anything but... I would like to point out that you can Farm Twinkling Titanite, Titanite Scales, and Slabs from the stone lizards at Dragon&apos;s Peak. Works best with the cluster of them past the second dragon you kill. It would have been nice if at least one dragon apostle were still alive. My idea would have him/her give some backlore to the area but little knowledge of what happened for he/she was in deep mediation when it all happened. Perhaps even be a merchant for odd hard to get items, like divine blessings and such. Heck, bring back the dragon bro covenant and put him/her as the arch-drake to rank up. It’s all wishful thinking really but tis something I wish they would have considered. 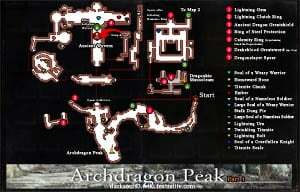 Does anyone else have a problem with getting to Archdragon peak? I picked up Hawkwood’s shield, but every time I try doing way of the dragon next to the petrified dragon guy nothing happens. So is anyone else having a weird graphical glitch issue with this area? I defeated Nameless King already and invaded in great belfry to which I died and now the area is covered in the rain and cloud effects. Thanks From! I noticed that this location didn&apos;t scale in difficulty or in number of souls dropped all that much between NG and NG+. Can anyone confirm if this is true? Is the new meta "I have to finish DS3 on sl50"? or whats going on? It&apos;s the absolute endgame area and people seem to run into there with sl60 or lower recently in hope 3 sunbros deal with NK for them. Seriously, if you are over sl80 the summon rate drops significantly. As a sunbro! The regular wyvern gave me 36000 souls, not 50000. Hawkwood summon is garbage in this area; just avoid it or summon him to damage the 3 giant axe enemies before he gets killed. Doesn&apos;t affect his questline, but he craps you over for summoning for the nameless king boss. Whenever I&apos;m farming for souls, I make it a personal challenge not to rest at a bonfire until every enemy on the map is dead. This is probably the hardest location in the base game to do accomplish such, but also the most fun. Lothric Knight Greatsword infused with Lightning is without a doubt the best weapon for this location, except maybe when you&apos;re taking on Nameless King. Also a great place for a wardrobe change, on account of the pleasantly bright lighting. I noticed something really interesting about the moon in the sky in Archdragon Peak: it’s flipped. 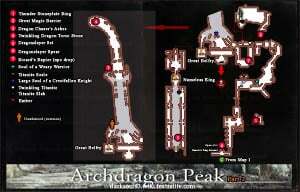 That means that assuming that the Dark Souls Earth is round, Archdragon Peak is in the Southern Hemisphere.